The Middleburg Charter School Committee grew from the activities of a group of concerned parents and community members. As Middleburg Elementary School was facing the threat of closure, these parents and community members joined together to secure the future of the school. Their goal: to keep a vibrant, public elementary school within the Town of Middleburg. With the encouragement and sanction of the Loudoun County School Board, a solution was found in the charter school model. Middleburg’s first school was called the “Stove Pipe Academy”. It was built in 1885 and contained rooms for the elementary grades on the ground floor and primary grades on the second floor. An addition was later built on the rear of the building to accommodate high school classes. The floors of the building were regularly oiled to withstand the water, snow, and mud that were often tracked in on the boots of the children. Students sat at desks that were nailed to the floor. When the “Stove Pipe Academy” was outgrown, the community raised funds to build a new school. Many fund raising activities were held and many local people contributed to the fund for the new school. Members of the Orange County Hunt, which was just becoming established in this area, were among the largest contributors. The new school was solidly built with hewn stone foundations and red brick walls. It had an outside entrance to the cellar heating plant (still in use today) and circular stained glass windows in the roof peak. Old photos show the prominent bell tower, still here today, and a rain barrel no longer in use. The first high school classes were organized around 1908. Graduation of the first class was held in 1912 at the Old Confederate Hall. An excellent early relationship was established between Middleburg School and the Foxcroft Academy. A “little red schoolhouse” was built on the grounds by Foxcroft and was used as a place to teach manual training by faculty and students from Foxcroft School. Miss Charlotte Noland taught gymnastics to the girls at Middleburg School and helped organize a girl’s basketball team, teaching them how to play the game and also refereeing games. High school classes were held at Middleburg through June 1934. After that time, Middleburg pupils attended Aldie High School until Loudoun County High School opened in 1954. 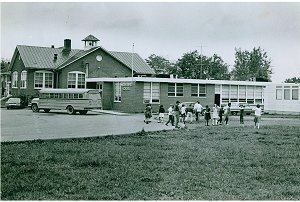 An addition to the original school in 1960 provided four classrooms, office space and restrooms. The old building was remodeled using acoustical ceiling tile, floor tile, and fluorescent lighting. Space was provided for a teachers’ workroom. 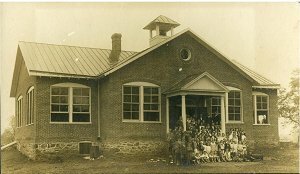 At the time of the dedication of the addition, the enrollment of Middleburg School was 168, with seven teachers including the principal. Today, the new addition and original school building house approximately 90 pupils. 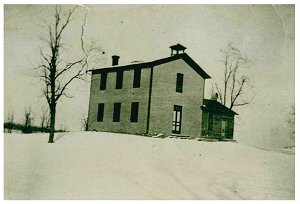 The “little red schoolhouse” behind the main building is now used for art instruction. In 1991 the original bell tower was refurbished and during the summer of 1992 a new blacktop area was added to the school grounds for recess and physical education activities. The summer of 1998, brought more change to the Middleburg School. A new computer lab was designed and equipped with 18 new computers. In addition, each classroom was provided with a four computer learning station. Also, the school library has received thousands of new books enriching the collection already housed at the Middleburg School.